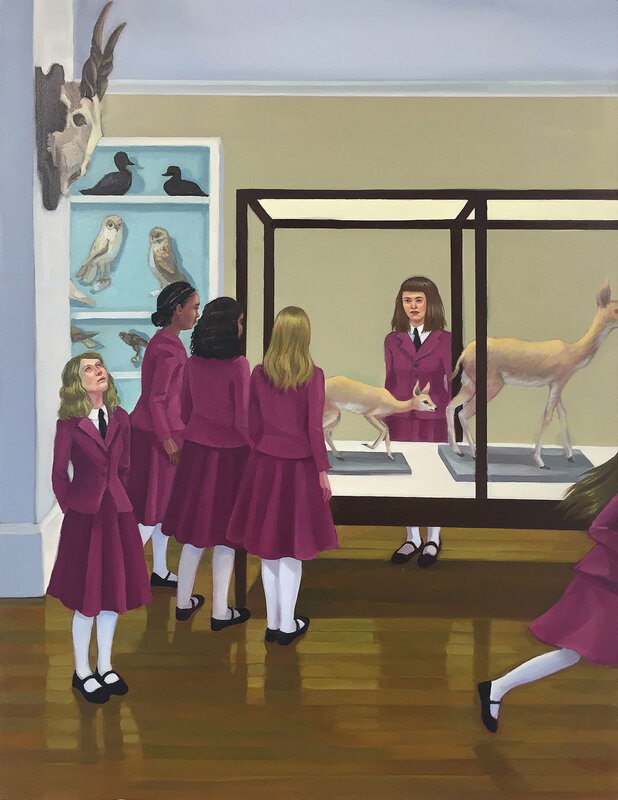 Painter Zoe Hawk has lived and exhibited all over the world, and has now returned to Columbia, Missouri with an extraordinary body of work for the Sager Braudis Gallery 2018 July Exhibit. Gallery Director Hannah Reeves asks Hawk about some of the ideas and process behind her work in this month's Q&A. HANNAH REEVES: The somewhat mysterious, underlying narrative in your work is intriguing, and I wonder about both the origin and the connecting thread of the stories. Could you talk about how you conceive of your scenes and characters? ZOE HAWK: I collect images from vintage schoolbooks, historical photography, mid-century magazines, and other sources, which I piece together to create my own imagined scenes. I also incorporate my own memories, as well as stories from other women in my life, although the paintings are meant to be more allegorical than illustrative. I like each action and pose, if possible, to have more than one meaning: one innocent and straightforward, and another more dark and complex. With each girl I paint, I try to think about what she is feeling, how she fits into the social order, and what her actions represent about adolescence, girlhood, and socialization. While there isn't one distinct overarching narrative that links all of the work (I tend not to repeat characters), I do like to think that they all inhabit the same little fictional world. HR: What does your process look like? ZH: I keep a library of source material that I peruse for inspiration. It includes both a physical collection of books and vintage ephemera, as well as digital images that I keep categorized in folders on my computer. Sometimes I construct a model out of painted cardboard as a visual reference to place my characters in, kind of like a miniature stage set. Once I have an idea in mind, I make a small study in gouache to figure out composition and color, before starting the larger painting on panel. Everything is pretty pre-planned, however things do tend to change a bit during the painting process. As I'm working I might decide to add another figure, switch the color of a dress, change a pose, etc. HR: Is there a sentiment or a reaction that you hope your viewers will experience when taking in your work? If so, how do you think about steering them toward it? ZH: I like my paintings to appear sweet and playful at first glance, then reveal upon closer inspection that things are not quite what they seem. My work is about the curiosity and freedom of girlhood, as well as the darker aspects of adolescence. So in my imagery, I often reference vintage children's book illustrations—which feel familiar to many people—but in a way that is somewhat off. One girl might not fit in with the group, or is acting out. Some kind of mysterious activity might be taking place. Maybe the clothing doesn't make sense for the environment, or the expressions on the girls' faces seem nervous or unhappy. In this way, I want the viewer to become unsettled. That said, I also enjoy when people find beauty in the work, or when it elicits a memory from their own childhood. Ultimately I want the work to be layered enough that it can do both. HR: Who/what are your artistic influences? ZH: Dorothea Tanning's painting Eine Kleine Nachtmusik is an all-time favorite of mine and a huge influence, as well as Balthus's The Mountain. I also love Leonora Carrington and Edward Hopper, and one of my favorite contemporary artists is Kerry James Marshall. The narrative aspect of my paintings is influenced by writers like Shirley Jackson, Margaret Atwood, and Charlotte Brontë. And when I go to an art museum I pretty much make a beeline for the Northern Renaissance section. HR: What is your studio quirk? ZH: The gouache studies I make before starting a painting are pretty small, about 2 or 3 inches tall. Instead of leaving them on the page, I like to cut them out so they become tiny, individual objects. I've been compiling them over the years, and like to think of them as my little library of ideas. I keep them in a satisfying stack; it's like collecting baseball cards or something. I've had quite a few people ask if they are for sale, but I just can't part with them!